Elegant, spacious and packed full of features, the Aston ZAA208 86 in. Steam Shower Whirlpool Bath with 9 Body Jets - Right Hand Installation - will be the perfect enhancement for any bathroom modern or traditional. This left-handed steam shower equipped with a whirlpool tub is an ideal replacement for any standard bathtub. Enhance your bathroom by installing this all-inclusive, pre-plumbed steam shower that will ultimately transform your existing space into a spa-like experience. Indulge into the 9 directional body jets, overhead rainfall shower or handheld shower with the easy control of the diverter valve. additional features including the steam generator that creates steam in under 5 minutes, whirlpool tub and radio will provide endless relaxation at your desire. Wash away stress and fatigue with the many features of the Aston ZAA210 87 in. Steam Shower Whirlpool Bath with 24 Body Jets - Right Hand Installation - including the steam function, overhead rainfall shower, a multi-functional handheld shower, 24 directional body jets or slip feet first into the whirlpool tub with 6 whirlpool jets. The LED control panel allows you to command your desired function with a push of a button and selection of the diverter valve. You will enjoy endless features in this unit as you step in, sit down, turn on the radio and begin your experience in this water oasis. The clean lines and dramatic geometric forms of the Dryden(TM) Bath Collection are based on style cues from the Art Deco period. Getting ready in the morning is far from routine when you are surrounded by a bath that reflects your personal style. Rainstation Diverter Kit is rated 4.6 out of 5 by 274. Rated 5 out of 5 by Jason from This kit helps attach any barrel to a downspout with... 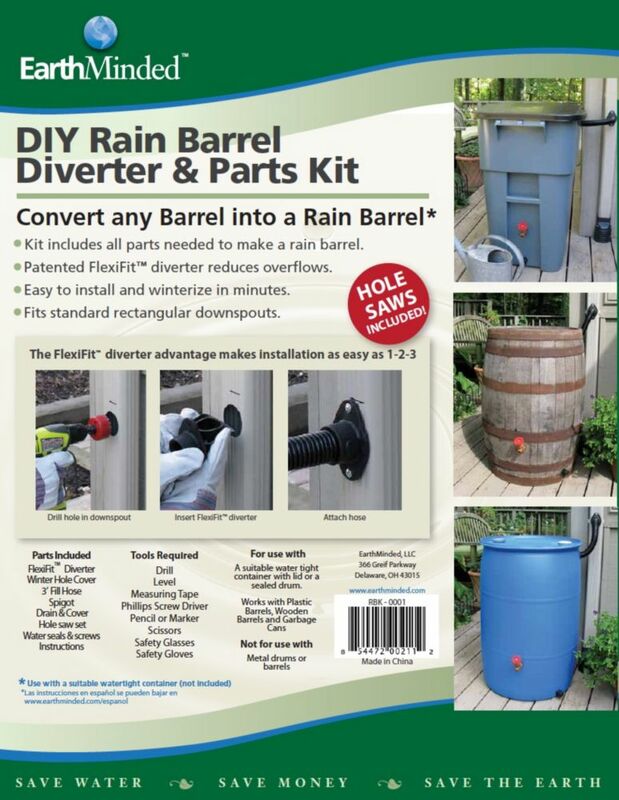 This kit helps attach any barrel to a downspout with minimal downspout cutting. If installed properly then the barrel will not overflow and your downspout will continue to function normally. The only downside is the price seems very high. Rated 4 out of 5 by Darlene50 from Thought this was kit ti divert water from one barrel... Thought this was kit ti divert water from one barrel to another. will use that part later. The faucet included worked great to replace leaking faucet. Rated 1 out of 5 by Samburt from Warning. . . This kit fits downspouts that measure 3"X4". Most downspouts sold at HD are 2"X3"!! Warning. . . This kit fits downspouts that measure 3"X4". Most downspouts sold at HD are 2"X3"!! Rated 5 out of 5 by Shell from Easy to install. This kit cam with everything needed, instructions were easy to follow and installation was a snap. No leaks. Working extremely well. Very satisfied with this product. Rated 4 out of 5 by Scott from The faucet portion is easy to install and works well. I would however recommend diverting the en... The faucet portion is easy to install and works well. I would however recommend diverting the entire downspout directly into the top of the barrel by using a flexible downspout attachment. And use the diverter hose to either act as an overflow hose, or as a hose to attach a second rain barrel. Rated 5 out of 5 by Joe from Exactly the correct product, worked like a charm and directions... Exactly the correct product, worked like a charm and directions were VERY clear.